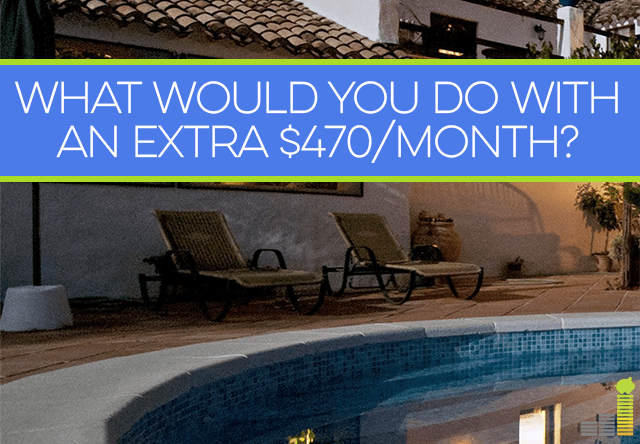 Well, today we’re going to talk about what you could do with an extra $470 each month. I know it’s a relatively odd amount, but hear me out as I have my reasons. If you’re wondering where or how I came up with the $470 amount it’s from one source – the average car payment we have in the United States. Car loans are nothing new. Many of us have had them, myself included – though I am planning on changing that with future car purchases. I’ve written about having a car loan a number of times, so it’s really nothing new. According to Reuters, auto sales are healthily beating estimates and were on pace in 2014 to be the best year for auto sales since 2003. Many of those sales are relying on auto loans as the average sales price is coming out to nearly $34,000 with an average loan of $28,000 or a $470 monthly car loan. While other types of debt like credit cards and mortgages are still below what they were when the financial poop hit the fan a few years ago. I don’t know about you, but I hate debt. I want to do anything I can to avoid taking on more debt. Aside from being obligated to someone, one of the biggest reasons I hate adding more debt is that it keeps you, generally speaking, (I know some debt can be used to your benefit like real estate) from growing wealth. That should be our ultimate goal – to grow our wealth. This is not to say that having a car payment is a bad thing. Many need a car and it isn’t feasible for them to save up tens of thousands of dollars to buy a car outright. Still, buying a car shouldn’t require you to throw common sense out it’s rear window. It should be purposeful and done with the idea of getting value. When I read quotes like I saw on Yahoo Finance that an SUV is the new starter home, it shows me our view is off. However, with the ease of access to car loans, many who buy cars today are saddling themselves with a payment for something that will return nothing in value. For most new car buyers then, their purchases are not doing anything to benefit their long term financial picture. What Can I Do With An Extra $470 Per Month? As we’re strongly considering buying a new to us car in the near future, seeing what the current average car loan is got me to thinking what we could do with an extra $470 per month as opposed to giving it to someone else for our shiny new to us car. I could go on, but you get the point. We could either do things like save money for retirement or cover other necessities substantially with an extra $470 per month. If we did happen on an extra amount like that each month we’d find other ways to make that money work for us like further investing, contributing more to our kids’ 529 accounts and likely something fun like putting away a little more each month for travel. The point is, we’d do something with it to make the money work for us and not the other way around. When you’re simply taking on a crazy big car payment because the credit is easy or because the car looks nice it’s putting you on the other side of the wealth building equation. Ok, now I turn it over to you. 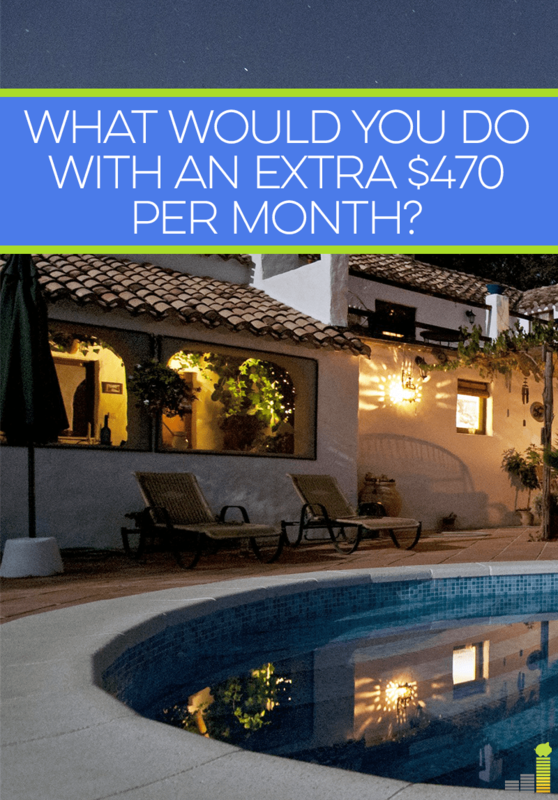 What could you do with an extra $470 per month? What things would be covered in your budget each month with that money? If you used part of it for fun what would it be? How much is too much for a car payment in your opinion? We’re actually on schedule to eliminate a $420 monthly car bill for my wife’s vehicle this year, so I’m already looking forward to putting that back into our budget and using it in other places. That’s pretty sad that ~$500 is what most people allow themselves to get saddled with when it comes to getting a new ride. When I bought my latest car to commute back and forth to work, I really had to commit myself to not going over $200 per month. It took some effort but was totally possible – and I got a pretty decent car! Very nice MMD! That’s a great problem to have…needing to figure out what to do with that kind of money. I know, that’s my thoughts exactly. It can be cut down, though it does take work. If I will have an extra $470 per month, some of it will go to our mortgage payment, groceries and to our emergency fund. For this year, I really want to increase our emergency fund. Sounds like a good plan Clarisse! We are due to have our third child in about two months – neither of our paid-off vehicles will fit all three children. As we are trying to pay off a significant amount of debt right now, we’re going to try to hold off as long as possible on buying a new vehicle. Every month that we can wait will be helpful. And when we do buy something – it will not be a new car and maybe we can trade in one of our current vehicles, so we can avoid such a large monthly expense. I know your pain Harmony – we have three little ones as well and really want a bigger car. We’re holding off so we can pay in cash as the last thing we want is to add a significant payment to our budget each month. One thing to consider is that you only need to grow your car’s carrying capacity slowly. My family of 5 got by with a Camry until my sister was 10 years old or so. My brother and I were already in middle and high school. We even went on family vacations in that car each year. Get a used family size sedan for a few years until you need a van or suv for moving lots of people and gear. You’ll save thousands of dollars when you need them most. I think it is strange that people take on car loans that big. I did it once in my early 20s and hated it. I can’t imagine having a perpetual car loan for the rest of my life! Same here Holly. We did the same thing – never again. I’d either put the money towards a retirement account or just a general investing account. The fact that so many people are OK with putting close to $500/month towards a car just shows you how so many most likely won’t reach financial independence. As you said, going into debt puts you on the wrong side of the debt equation. By investing that money instead you will come up much farther ahead in the long run. We’d very much do the same thing Jon. My thoughts exactly, it does nothing to help you build wealth. Funny you should ask. I received my first social security check this month and it is $457. It is low because I actually spent little time working in a job covered by Soc. Sec. I have that check go directly into my Vanguard investment account making it available to grow along with our other investments. Because we are building a new house this year, it will eventually be earmarked to higher real estate taxes. Very well timed then Kathy! 🙂 Very nice, especially since it can help tackle your higher tax payments. I know, I about fell out of my chair when I read the amount. That’s what I’m saying Tonya – be sensible about it. Many do need to take on a loan, but there can be some wisdom involved. I don’t like car payments, but there may be a time and a place for one. For example, we needed a new van about a year ago. We bought a used one (one year old), and since we just finished our DMP, we didn’t have the ability to pay cash. We took out a loan, but it will be the last auto loan we ever take out. We’ll pay on that van fora few years, but plan to keep it for about 10. The delta time between the end of the current loan, and when we need a new vehicle will be spent saving for that new car. It’s all about looking ahead and making a plan for the future! Oh, I definitely agree Travis. There is a time and place for many. God knows I’ve been there. The point is that many simply don’t stop and think about the amount they’re taking on which will only hinder them in the long run. If I had an extra $470 I would save $200 of it and apply the rest towards my debt. Sounds like a good plan – saving and paying off debt…I like it! It would be a toss up between tackling our mortgage faster or saving up for some much needed home repairs. There are some things that I know are on their last leg in our home and I would hate to have to use our emergency fund for a new roof. I hear you on that one Rebecca. I typically don’t like to dip into the EF for things like that. Thanks to NYC living I’ve never made a car payment in my life- well, except for the one or two rentals. Unfortunately, that extra $400 plus dollars probably goes into my city living costs. $470 would cover my rent/utilities, cell phone, and car/apartment insurance bills. So that’s what I’d do with the extra! I can’t imagine myself paying that much monthly for a car. I guess maybe if I was making twice as much money as I am now. If I had to buy a car this year, I’d probably go for something used but new-ish, in the $15000 range, planning for it to last about 15-20 more years. $1000 per year is about the most I want to pay for a car, and even that seems so high to me. I’d probably try to get a base car payment of $200-250/month and then pay extra on it to pay it off faster. If we had to take on a car payment I’d go for that range as well but would probably just pay it off as soon as possible. My car loan is half that amount but it’s still a lot of money to me every month. I just wrote about this today as I’ve been thinking a lot about what I could be doing with that money other than spending it on a car! I’m seriously considering getting rid of it in the next few months. Best of luck in killing it! When we paid our last car payment ever a few years ago, that money went straight in to debt repayment and now goes toward extra principal payments on our house. I can’t live in my car, so I think I’m getting a better deal. Nothing makes me sadder than to see someone dig themselves out of a financial mess and then go out and buy a brand new car. No one needs a car that costs $34,000! I feel the same way Kim, you can’t live in the thing and the last thing I want is something that costs 1/3 of our original mortgage. Oh, I could certainly find lots of things to do with an extra $470 a month. Most likely though, I’d bump up our retirement savings and add to our entertainment fund, assuming there wasn’t a stronger need elsewhere. 🙂 We do pay cash for our cars and I certainly encourage others to do that when possible, but I’m not anti-car loans as long as they are thoughtful decisions, like you said. Not buying a car that you really can’t afford because you can get a loan or worse – those who immediately run out and buy a car just to keep up, even though their current vehicle is fine. I’m with you there Shannon…we could totally find ways to use that extra $470. I agree on the thoughtful decision aspect, not one I’ve made in the past but is vital to have. This is definitely an issue of cash flow. Of course, assuming getting a loan DOESN’T mean getting a nicer car (perhaps an ignorant thought), it’s better to invest the money. Car loans for people with excellent credit are around 3%, sometimes lower. You can invest that money in an index fund and have higher gains than if you paid for the car up-front. Agreed, to a certain extent DC. The problem arises though is how many of these people taking on the average loan have the money leftover each month to invest. I’d venture to guess that a good number of them don’t have the necessary resources to do so. The extra money would go towards increasing my student loan payments by around $300. The other portion would go towards funding my Roth IRA which I’m not too sure if I will max it out this year! I’m still on first car (a 2004) and have never had a car payment. I bought this car used and probably will do the same next time. Nice work on the car Debt Hater – can’t complain about never having a car payment! I’m also a proponent of paying cash for cars. Used cars are a much better value (in most instances) and I’d hate having a car loan. We’re clinging to our 19-yr-old Honda Odyssey for as long as possible :). And, $470 would cover almost exactly half of our monthly non-mortgage expenses! It’s funny, I never was a fan of paying cash for a car and the prospect of of having a ridiculous car payment anymore is more than enough to cure me of that. I’ve known folks that have a higher car payment than that, for something like 7-8 years. It hurts me!! $470 would more than cover our grocery bill (our mini eats like he’s a full-grown human) each month. If we were to get an extra $470 a month, we would most certainly send it to retirement savings or taxable investments. Building our investment portfolio is our #1 priority now that we’ve made a plan for eliminating our mortgage debt… tricky balancing act there! I know – I wrote a post several years ago about people taking 8 year payments. Paying for nearly a decade for a car is beyond preposterous. I’d probably take $50 for my Fun Fund (buying tickets, travel, etc) and would put the rest towards our house-buying plan. Exactly! We’d put some of ours towards travel. Funny enough, other than debt i would use the $470 to save for a car haha. We want a second car within the next 2 years and $470/mo over 24mos would be more than enough! Ha ha, I know the feeling Catherine. We’re trying to hit $30k within the next 2 years so every little bit would help. If I had that extra money every month, I would take $100 a month to build a travel fund because we would like to travel more with our son and then I would invest the rest. A car payment is a tough thing to have every month and I am frequently fighting my clients with no car payments to not take on a new one. I have them save their estimated car payment every month in a savings account so that they can get used to the monthly expense and then if they decide to pull the trigger, they will have a good down payment in store as well as a budget adjusted around that number. We’d definitely put some of the extra cash towards more travel. I imagine you’d be battling clients with that. I’ve had similar discussions with friends and family members and they have no issue at all with having payments. Suffice it to say they’re usually just in an endless loop of payments. It seems the biggest problem most people have is buying big cars. Like you mentioned, it’s almost a rite of passage to have an SUV, when you can get a corolla or a camry for much less than $470/month for little or no down payment. And bigger cars cost more to insure and fill up with gas as well. But with that much extra money per month coming in, I would put it right towards student loan debt. Don’t even want to give myself the chance to spend it! I couldn’t agree more Syed. I couldn’t believe it, though know it’s true, when I read the quote that the SUV is the new starter home. Then you add in all those other increased costs and it only makes it worse. I am convinced that one of the biggest reasons that so many people struggle from month to month and never really get ahead is because of car payments. When I was younger I was convinced that you will always have a car payment. I could not imagine that shy of being a millionaire that anyone would ever be able to pay cash for a car. That was just a pipe dream that wasn’t realistic. Fast forward a few years and coming ot the realization that my debts were not a blessing we have paid off all of our debts except for our house and we save up and pay cash for our cars. I currently have about a 40 mile one way commute each day for work, so I spend a couple hours a day in the car. My younger self would have used that as an excuse to go buy a fancy new car. Gotta be comfortable and safety is important when I am driving that much right? Now I look at it as I am destroying that vehicle’s value by driving that many miles so I want to destroy the least expensive vehicle I can that will still get the job done. My last purchase was a used Toyota Camry that I bought for about $5000 cash. It’s several years old and doesn’t have all of the latest wiz bang features that new cars come with, but the truth is I probably would rarely use most of those features anyway and when I need them I have other ways of accomplishing the same thing. It’s comfortable, reliable, gets decent gas mileage and probably will give me at least 150,000 miles of good service. It can be done. You just have to learn to think a little differently. I could afford a new car payment. But if I did that I wouldn’t be able to save for my son’s college and wouldn’t be able to save nearly as much for retirement. It’s all about choices. “It’s all about choices.” <----my thoughts exactly Bob. I used to think that you couldn't buy a car without taking out a loan. Almost as if it's simply a given and crazy to think otherwise. But, that view has changed. It's all about value and making your money work for you in the best way possible. Being saddled with a 5+ year car loan goes little towards either of those. We could cover most of our groceries for the month with the extra $470. Our current loan is $324/month, however, we went the loan route instead of buying it outright when we got 0% interest for it. We put the car money into investing instead, and I have no problem paying that note each month. I have worked with a guy in the past that had $740/mo payments for a 7 yr loan…. They thought it was a great deal. I couldn’t even imagine spending that much on a vehicle or committing to a payment that high for that long. I can see that Mr. SSC. I’d probably pay it off as soon as I could even at that, but fully own that’s largely because I wouldn’t want to deal with the payment. $470 covers the groceries with some room to spare or buys us an extra Costco meat run! HSA comes to mind as well, that and a little extra on the house payment. Yep, definitely a chunk of change to use of things. I want a new car, but I won’t be getting one for at least a couple of years. I would like to say I’d use that $470 for debt payments, but I’d probably use some of it for fun too. I think a mix is a relatively good approach to take. I’d be splitting it right down the middle – $235 onto my student loans to speed up the pay off, and the remaining half into savings. Sounds like a good plan to me Anne! That it is Amanda. I think for many that’s likely the issue that got them there in the first place. I used to have a $500 a month car payment. Never again. I was so happy the day that was gone. I’ll drive that vehicle in to the ground and the next one will certainly be used and for cash.